The reported seizure Monday of the Aris 13 came as a surprise to the global shipping industry as patrols by the navies of NATO countries, as well as China, India and Iran, had suppressed Somali pirate hijackings for several years. However, the United Nations warned in October that the situation was fragile and that Somali pirates "possess the intent and capability to resume attacks." One expert said some in the region had let down their guard as the situation calmed. 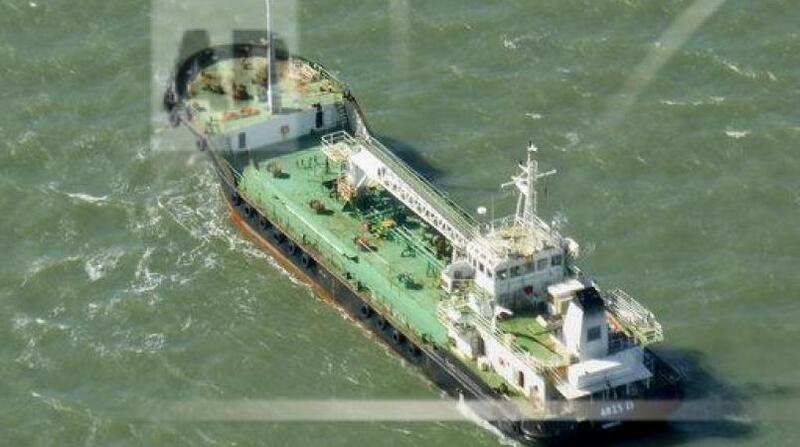 The Aris 13, manned by eight Sri Lankan sailors, was carrying fuel from Djibouti to Somalia's capital, Mogadishu, when it was approached by men in two skiffs, said John Steed, the director of Oceans Beyond Piracy. An official in the semiautonomous state of Puntland said over two dozen men boarded the ship off Somalia's northern coast, an area known to be used by weapons smugglers and members of the al-Qaida-linked extremist group al-Shabab. The official spoke on condition of anonymity because they were not authorized to speak to journalists. The ship was anchored Tuesday off the town of Alula, said Salad Nur, a local elder. "The ship is on the coast now and more armed men boarded the ship," he told The Associated Press by phone. A Britain-based spokeswoman for the European Union Naval Force operation off Somalia, Flt. Lt. Louise Tagg, said an investigation was underway. The U.S. Navy's 5th Fleet, which is based in Bahrain and oversees anti-piracy efforts in the region, did not immediately respond to a request for comment. A U.N. shipping database shows the Aris 13 is owned by a company called Armi Shipping SA, whose address is listed in care of Aurora Ship Management FZE, a company based in Fujairah in the United Arab Emirates. Calls and emails to Aurora went unanswered. An address listed for Flair Shipping in Dubai's high-rise neighborhood of Jumeirah Lake Towers was for a company called Flair Oil Trading DMCC. A woman who answered the door Tuesday told an AP reporter the firm wasn't connected to the ship and directed him to another office.